Before anything else, let’s get to the point: Brawlout is fun. Like, really, actually, seriously fun… Not the kind of fun where you stay up late, rehearsing combos of your favorite characters, and toiling through learning skill chains of difficult characters to ensure that you have a well-rounded counter to whomever you may face — which isn’t even really fun, by the way, unless you win. Instead, we’re talking about the kind of fun brings back memories of being huddled around a CRT television with three other friends and a Gamecube, laughing when some rendition of a Nintendo character flew off the screen after getting hit with a Pokeball. Now that that’s out of the way, the mood is set for me to expand upon my love of Brawlout. The game was developed by Angry Mob Games, a publisher known more for mobile titles than platformers, though they do have another arena fighting game on Steam called Muffin Knight, which features similar aesthetics, and some early version of gameplay that may well have morphed into what Brawlout is today. 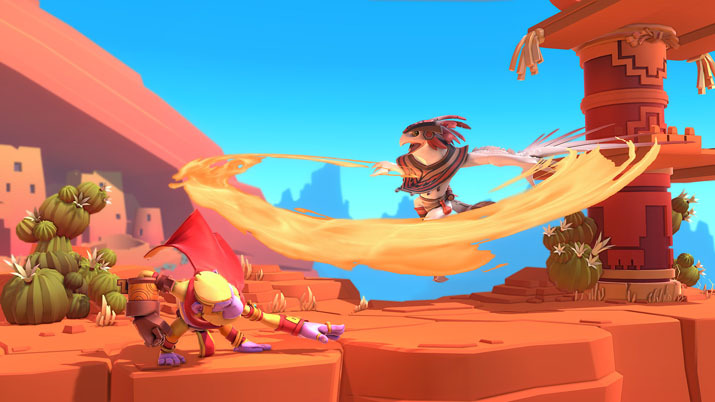 Brawlout is an arena-style platform fighting game that seems to heavily target adoption in the competitive scene, while also accessible enough to play on the couch with your friends, while presumably drinking the proverbial Mountain Dew and eating the next version of Flaming Hot Cheetos. Although limited in playable characters in its current beta stage, each of the available characters offers unique strengths and special moves. Olaf Tyson, Sephi’ra, King Apu, Chief Feathers, Paco, and Volt make up the cast of available fighters, and they are all meticulously created, it seems, to play to each others weaknesses, if leveraged correctly. The character models are gorgeous, as is the rest of the title, and the ability to immediately customize the colors of each one adds a nice layer of personalization. My immediate inclination was to choose Volt (an electric wolf) because he looked rad, but I quickly learned that if you don’t know how to play with each character correctly, you will lose. I want to expand upon losing a little bit, mostly because I lost — a lot. 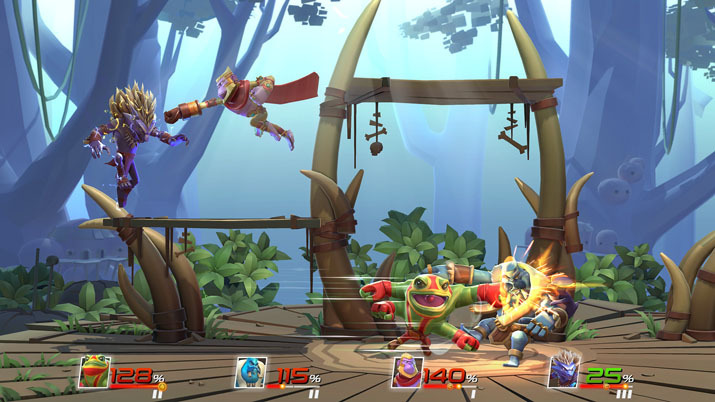 People tend to take fighters like this very seriously, and with the work that Angry Mob Games has put into this release, Brawlout will be no exception. The controls are very tight and snap well when in the middle of combat. The pace can be frenetic and flurried, but if you properly execute the combos available to your chosen fighter, the game almost turns into a dance [EN: As all good fighters should]. There were times where an online enemy and I seemed to have difficulty actually hitting each other as we both strafed, pivoted, and jumped out of oncoming attacks simultaneously. Although there is a strong combo system and great movement in the game, the fact that there were only two attack buttons left me wanting more. I could either do a primary attack, or a special attack, and although these attacks changed based upon direction of the controller and momentum of the character, I was left unfulfilled on a few occasions. I know that the item-based element of the Super Smash Brothers games is not exactly competition kosher [EN: It’s not], I think that the random nature of a similar system in Brawlout could be a welcome addition in the future. The biggest issue with this title has more to do with the fact that it is in beta than anything to do with the gameplay or mechanics which have already been implemented. Currently, you have the ability to play 1v1 against an online opponent (ranked or unranked), or you can play offline with either the CPU or in a local lobby, but there isn’t much more to do. With a limited character pool, no story mode, and very few people that own the game due to its current release state, it is hard to stay online and interested for long periods of time. This is a common plight of the fighting games though, and that is why they are best suited for competitive scenes or large groups of people playing together. There is no doubt that as this game gains traction in the competitive community, and with piles of kids looking to beat the crap out of each other in a colorful way, Brawlout will find success. I am glad that I am here at the beginning, since it will make it more fun to experience the ride.